Byodo-In Temple in O'ahu, Hawai'i. Welcome to the striking Byodo-In Temple at O’ahu’s Valley of the Temples Memorial Park in Hawai’i. 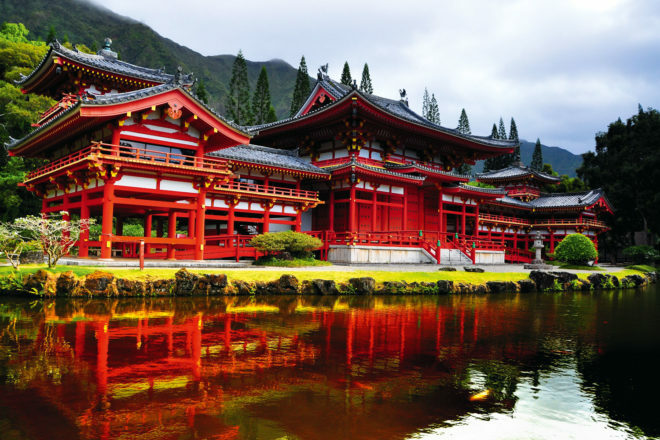 This striking replica of Japan’s Byodo-In Temple was built in 1968 at O’ahu’s Valley of the Temples Memorial Park to commemorate 100 years since the first Japanese immigration to Hawai’i. The 950-year-old original, located across the Pacific in Kyoto, began its life as a villa for regents of the imperial throne and is one of the most recognised temples in Japan, with its image replicated on the back of the 10 yen coin. However, the smaller-scale Hawaiian version is not to be outdone by the original. Inside, the temple boasts a nine-foot Lotus Buddha covered in gold and lacquer, said to be the largest ever carved outside of Japan; and amongst the Japanese-style gardens sits a three-tonne brass sacred bell ringing out meditative tones. The serenely beautiful temple is intended for people of all denominations to worship and meditate or for travellers to simply appreciate the tranquil surrounds: small waterfalls, large koi ponds that cover two acres, and a backdrop of the towering Ko’olau mountain range.